The Berlin Palace (German: Berliner Schloss or Stadtschloss), also known as the Berlin City Palace, is a building in the centre of Berlin, located on the Museum Island at Schlossplatz, opposite the Lustgarten park. It was a royal and imperial palace and served mostly as the main residence of the Electors of Brandenburg, the Kings of Prussia and the German Emperors. Demolished by the government of East Germany during the 1950s, the palace is currently being rebuilt, with completion expected in 2019. The reconstructed palace will be the seat of the Humboldt Forum, a museum for world culture which is a successor museum of the Ancient Prussian Art Chamber, which was also located in the Berlin Palace. The Humboldt Forum has been described as the German equivalent of the British Museum. The palace was originally built in the 15th century and changed throughout the next few centuries. It bore features of the Baroque style, and its shape, finalised by the middle 18th century, is for the most part attributed to German architect Andreas Schlüter, whose first design is likely to date from 1702, though the palace incorporated earlier parts seen in 1688 by Nicodemus Tessin. It served as a residence to various Electors of Brandenburg. It was the principal residence and winter residence of the Hohenzollern Kings of Prussia from 1701 to 1918. After the unification of Germany in 1871, it also became the central residence for the German Emperors. After the proclamation of the Weimar Republic in 1918, the palace became a museum. In World War II, the building was heavily damaged by Allied bombings. Although it could have been repaired, the palace was demolished in 1950 by the German Democratic Republic authorities, despite criticism. In the 1970s, the Palace of the Republic was constructed on its site, but demolished in 2008 to make place for the reconstruction of the old palace. Following the reunification of Germany, it was decided to rebuild the entire exterior of the palace in the original style except for the east side. The authentically reconstructed facades will include various remnant sculptures and rocks of the original palace. The interior will be modern, except the facades of one of the courts which is constructed in original style (Schlüterhof). However, the floorplan has been designed to allow potential future reconstruction of notable historical rooms. The building will house the Humboldtforum museum and congress complex, and is scheduled to be finished 14 September 2019. The palace replaced an earlier fort or castle guarding the crossing of the Spree river at Cölln, a neighboring town which merged with Berlin in 1710. The castle stood on Fishers' Island, as the southern end of the Museum Island in the Spree is known. 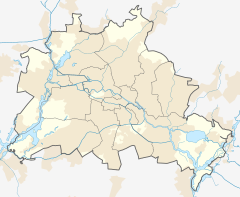 In 1443 Frederick II "Irontooth", Margrave and Prince Elector of Brandenburg, laid the foundations of Berlin's first fortification in a section of swampy wasteland north of Cölln. At the completion of the castle in 1451, Frederick moved there from the town of Brandenburg. The main role of the castle and its garrison in this period was to establish the authority of the Margraves over the unruly citizens of Berlin, who were reluctant to give up their medieval privileges to a monarchy. In 1415 King Sigismund had enfeoffed the Hohenzollern princes with Brandenburg, and they were now establishing their power and withdrawing electoral privileges which the cities had attained in the Brandenburg interregnum of 1319–1415. The castle also included a chapel. In 1454 Frederick II, after having returned via Rome from his pilgrimage to Jerusalem, made the castle chapel a parish church, richly endowing it with relics and altars. Pope Nicholas V ordered Stephan Bodecker, then Prince-Bishop of Brandenburg, to consecrate the Chapel to Erasmus of Formiae. On 7 April 1465, at Frederick's request, Pope Paul II attributed to St Erasmus Chapel a canon-law College named Stift zu Ehren Unserer Lieben Frauen, des heiligen Kreuzes, St. Petri und Pauli, St. Erasmi und St. Nicolai. This collegiate church became the nucleus of today's Evangelical Supreme Parish and Collegiate Church, adjoining the site of the castle. In 1538, the Margrave Joachim II demolished the palace and engaged the master builder Caspar Theiss to build a new and grander building in the Italian Renaissance style. After the Thirty Years War (1618–1648), Frederick William (1620–1688), the "Great Elector", embellished the palace further. In 1688, Nicodemus Tessin designed courtyard arcades with massive columns in front. Not much is known about the alterations of 1690–1695, when Johann Nering was the court architect. Martin Grünberg continued the alterations in 1695–1699. In 1699 the Elector Frederick III of Brandenburg (who took the title King in Prussia in 1701, becoming Frederick I), appointed the architect Andreas Schlüter to execute a "second plan" in the Italian manner. Schlüter's first design probably dates from 1702; he planned to rebuild the palace in the Protestant Baroque style. His overall concept in the shape of a regular cube enclosing a magnificently ornamented courtyard was retained by all the building directors who succeeded him. In 1706, Schlüter was replaced by Johann Friedrich Eosander von Göthe, who designed the western extension of the palace, doubling its size. In all essentials, Schlüter's balanced, rhythmic composition of the façades was retained, but Göthe moved the main entrance to the new west wing. Frederick William I, who became king in 1713, was interested mainly in building up Prussia as a military power, and dismissed most of the craftsmen working on the Stadtschloss. As a result, Göthe's plan was only partly carried out. Nevertheless, the exterior of the palace had come close to its final form by the mid-18th century. The final stage was the erection of the dome in 1845, during the reign of Frederick William IV. The dome was built by Friedrich August Stüler after a design by Karl Friedrich Schinkel. Subsequent major works were limited to the interior, engaging the talents of Georg Wenzeslaus von Knobelsdorff, Carl von Gontard and many others. The Stadtschloss was at the centre of the Revolution of 1848 in Prussia. Huge crowds gathered outside the palace to present an "address to the king" containing their demands for a constitution, liberal reform and German unification. Frederick William emerged from the palace to accept their demands. On 18 March, a large demonstration outside the Stadtschloss led to bloodshed and the outbreak of street fighting. Frederick William later reneged on his promises and reimposed an autocratic regime. From that time onwards, many Berliners and other Germans came to see the Stadtschloss as a symbol of oppression and "Prussian militarism". In 1871, King William I was elevated to the status of Emperor (Kaiser) of a united Germany, and the Stadtschloss became the symbolic centre of the German Empire. The Empire was, however, at least in theory a constitutional state, and from 1894 the new Reichstag building, the seat of the German parliament, came to rival and overshadow the Stadtschloss as the centre of power. In conjunction with Germany's defeat in World War I, William II was forced to abdicate both as German Emperor and as King of Prussia. In November 1918, the Spartacist leader, Karl Liebknecht, declared the German Socialist Republic from a balcony of the Stadtschloss, ending more than 400 years of royal occupation of the building. During the Weimar Republic, parts of the Stadtschloss were turned into a museum, while other parts continued to be used for receptions and other state functions. Under Adolf Hitler's National Socialist (Nazi) Party, which laid to rest monarchist hopes of a Hohenzollern restoration, the building was mostly ignored. During World War II, the Stadtschloss was twice struck by Allied bombs: on 3 February and 24 February 1945. On the latter occasion, when the air defence and fire-fighting systems of Berlin had been destroyed, the building was struck by incendiaries, lost its roof and was largely burnt out. The end of the war saw the Stadtschloss a burned-out shell of its former glory, although the building had remained structurally sound and much of its interior decoration was still preserved. It could have been restored, as many other bombed-out buildings in central Berlin later were. However, the area in which it was located was within the Soviet Union zone, which became the German Democratic Republic. The building was used for a Soviet war movie ("the Battle of Berlin") in which the Stadtschloss served as a backdrop, with live artillery shells fired at it for the realistic cinematic impact. The site of the City Palace in 2007, with the Palast der Republik being demolished. The new socialist government declared the Stadtschloss a symbol of Prussian militarism, although at that time there appeared to be no plans to destroy the building. Some parts of it were in fact repaired and used from 1945 to 1950 as an exhibition space. A secret 1950 GDR Ministry of Construction report, only rediscovered in 2016, calculated that reconstruction of the damaged Palace could be achieved for 32 million GDR marks. However, in July 1950 Walter Ulbricht, the new General Secretary of the Central Committee of the Socialist Unity Party of Germany, announced the demolition of the palace. Despite objections, its removal commenced in September 1950, the process taking four months and consuming 19 tons of dynamite. So solid was its construction that the dome and its entire mount remained intact even after it is fell to the ground. Only one section was preserved, a portal from the balcony from which Karl Liebknecht had declared the German Socialist Republic. It was later added to the Council of State building (Staatsratsgebäude), with an altered cartouche, where it forms the main entrance. The empty space where the Stadtschloss had stood was named Marx-Engels-Platz and used as a parade ground. In 1964, the GDR built a new Staatsrat or Council of State building on part of the site, incorporating Liebknecht's balcony in its facade. From 1973 to 1976, during the government of Erich Honecker, a large modernist building was built, the Palast der Republik (Palace of the Republic), which occupied most of the site of the former Stadtschloss. Shortly before German reunification in October 1990, the Palast der Republik was found to be contaminated with asbestos and was closed to the public. After reunification, the Berlin city government ordered the removal of the asbestos, a process which was completed by 2003. In November 2003, the German federal government decided to demolish the building and leave the area as parkland pending a decision as to its ultimate future. Demolition started in February 2006 and was completed in 2009. East Germans resented the demolition, especially those for whom the Palace of the Republic had been a place of fond memories, or who felt a sense a dislocation in a post-communist world. From 2008 until the commencement of construction in 2013, the large area of original Schlossplatz became a grassed field, laid out on minimal lines with wooden platforms. At the same time, the Berlin Monument Authority (Landesdenkmalamt) undertook extensive archaeological excavations. Parts of cellars that had been situated in the south-west corner of the former Palace were discovered and it was decided these would be preserved and made accessible to visitors as an "archaeological window". Following reunification a 20-year-long debate commenced as to whether the palace should be reconstructed, and whether this should be in part or whole. 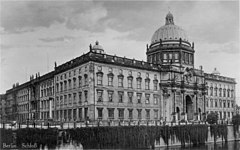 Pro-reconstruction lobby groups argued that the rebuilding of the Stadtschloss would restore the unity and integrity of the historical centre of Berlin, which includes the Berliner Dom, the Lustgarten and the museums of Museum Island. Opponents of the project included those who advocated the retention of the Palast der Republik on the grounds that it was itself of historical significance; those who argued that the area should become a public park; and those who believed that a new building would be a pastiche of former architectural styles; would be an unwelcome symbol of Germany's imperial past; and would be unacceptably expensive for no definite economic benefit. They also argued that it would be impossible to accurately reconstruct the exterior or interiors of the building, since neither detailed plans nor the necessary craft skills are available. Others disputed this, claiming that sufficient photographic documentation of both existed when it was converted to a museum following 1918. The ideological divide was symbolised by two groups. The Association for the Preservation of the Palace of the Republic (Verein zur Erhaltung des Palastes der Republik) championed a renovation of the GDR building that would incorporate a re-creation of the principal western facade the City Place, for a multipurpose people's centre similar to the Centre Pompidou in Paris. The Berlin City Palace Sponsoring Association (Förderverein Berliner Stadtschloß) argued for complete external reconstruction of the City Palace, considering it the only option that would restore the aesthetic and historic ensemble at Berlin's heart. It also rejected suggestions that the proposed meticulous reconstruction would be an unauthentic 'Disney' replica, drawing attention to the fact that most centuries-old stone buildings are, by dint of aging and repair, at least partial reconstructions; and that the argument that the present time can only represent itself in its own architectural language, is simply ideology. It also drew attention to the Venice Charter observation that "historic edifices have a material age and an immaterial significance" – an importance that transcends time, and justifies their reconstruction to preserve a vital part of urban identity and historical memory, provided that sufficient documentation for a truly authentic copy exists. In 1992 von Boddien co-founded with Kathleen King von Alvensleben, what evolved to be the Berlin City Palace Sponsoring Association – which became the most influential lobby group. The Association accumulated plans that had been believed lost, and funded a research project at the Technical University of Berlin to measure surviving photos and drawings of the Palace to create precise architectural plans. In 1993, on the world's largest scaffolding assembly, it audaciously erected a trompe-l'oeil mockup of two frontages of the Stadtschloss facade on a 1:1 scale on plastic sheeting. Privately funded by donations and sponsorship this coup de théâtre stood for a year and half. Showing a vision of central Berlin lost for fifty years, and how the palace could provide the missing link to the historical ensemble of the Zeughaus, the Altes Museum, and the Berlin Cathedral, the spectacle brought the debate to a temporary climax in 1993/4. While opinion continued to remain divided, it succeeded in winning over many politicians and other key figures for the endeavour. In view of the previous opposition, including high cost, and most importantly, the psychological and political objections, successive German governments had declined to commit themselves to the project. However, by 2002 and 2003 cross-party resolutions of the Bundestag reached a compromise to support at least a partial rebuilding of the Stadtschloss. In 2007, the Bundestag (German parliament) made a definitive decision about the reconstruction. According to this compromise, which had been drawn up by a commission, three façades of the palace would be rebuilt, but the interior would be a modern structure to serve as a cultural museum and forum. An architectural competition was held, and in 2008 the jury chose the submission by Italian architect Franco Stella. Some of the internal spaces in Stella's design follow the exact proportions of the original state rooms of the palace, so as to facilitate their reconstruction at a later date should this be desired. The reconstruction also reproduces the original metre-thick width of the outer walls. However these have been rebuilt as a sandwiched construction: an inner retaining wall of concrete, followed by a layer of insulation, and an outer wall of brick, sandstone and stucco which replicates the original. Reconstruction of the Renaissance-gabled Pharmacy Wing, which connected to the Stadtschloss on the north side, would be another possible future project. Panorama of how the finished reconstruction will look. Due to German government budget cuts, construction of the "Humboldtforum", as the new palace was titled, was delayed. The foundation stone was finally laid by President Joachim Gauck in a ceremony on 12 June 2013 signalling the launch of a €590M (£500M) reconstruction project. On completion in 2019 the building will house a modern museum containing collections of African and other non-European art, as well as two restaurants, a theater, a movie theater and an auditorium. ^ Wolf Burchard. "What's the point of rebuilding Germany's palace". Apollo Magazine. Retrieved 2018-09-07. ^ Tim Adams. "Neil MacGregor: 'Britain forgets its past. Germany confronts it' | Culture". The Guardian. Retrieved 2017-06-07. ^ "So verlief das Richtfest am Berliner Schloss (Topping-out wreath ceremony at the Palace, German article)". Tagesspiegel. Retrieved 13 June 2015. ^ Ingo Materna and Wolfgang Ribbe, Geschichte in Daten – Brandenburg, Munich and Berlin: Koehler & Amelang, 1995, p. 68. ISBN 3-7338-0188-1. ^ "Geheimes Gutachten: Krimi um die Sprengung des Berliner Schlosses". Bz-berlin.de. Retrieved 2016-08-25. ^ "Jetzt aufgetauchtes Gutachten belegt | DDR hätte Stadtschloss für 32 Millionen Mark retten können". Bild.de. Retrieved 2016-08-29. ^ Stubbs, John H.; Makaš, Emily G. (2011). Architectural Conservation in Europe and the Americas. John Wiley & Sons. ^ Rettig, Manfred (2013). The Berlin Palace Becomes The Humboldt Forum. Humboldt Forum Foundation. ^ "Berlin's City Palace Controversy Refuses to Die". Dw.com. Retrieved 2017-06-07. ^ Whitney, Craig R. (1993-07-12). "A Berlin Palace Stirs in Its Grave". The New York Times. ISSN 0362-4331. Retrieved 2016-08-23. ^ Oswalt, Philipp (1 February 2008). "Das Stadtschloss-Geschäft" [The Berlin Palace Business]. Bauwelt (in German). pp. 7–8. Retrieved 2017-06-07. ^ Harriet Alexander (12 Jun 2013). "Berlin begins reconstruction of King Frederick the Great's palace". The Telegraph. Retrieved 14 June 2013. Wikimedia Commons has media related to City Palace, Berlin.